Historical Research – Never a Dull Moment! Conducting historical research is never straightforward. I’ve written before about our struggle to identify the vegetation that was outside of Banting House National Historic Site of Canada when Sir Frederick Banting occupied the house between 1920 and 1921: we had been using two images that were not particularly clear and didn’t show the full length of the west side of the property that we were focusing on. Little did we know there was another photograph right under our noses that could give us some great insight into what had been growing in front of Banting House in the 1920s! Grant, the Curator at Banting House, was away for a few days last week. While he was gone I had a chance to explore part of the museum collection and I happened to stumble upon a photograph of the house that was donated by Mrs. Dorothy Shaw, whose mother-in-law Mrs. Lila Shaw had purchased the building from Banting in September 1921. The photo was not dated, but it’s likely that it was taken soon after the Shaw’s moved into the house. 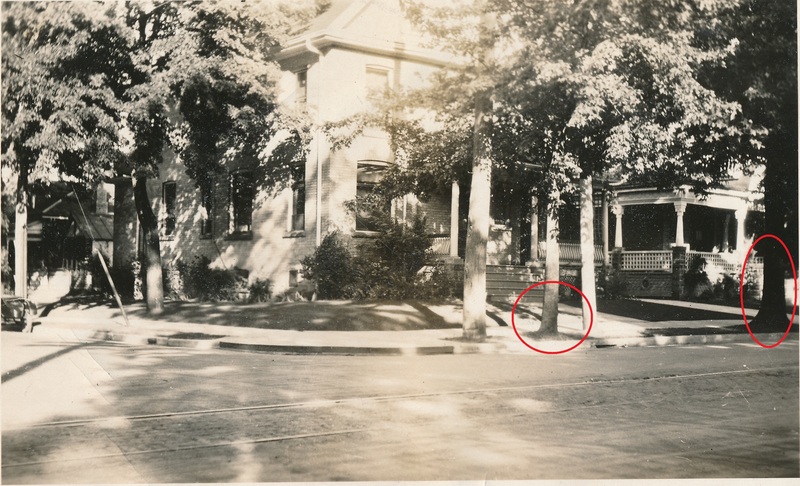 The photo showed that there were two trees outside of Banting House opposed to just one as we had originally thought and that there was in fact a bush just north of the stairs! The infamous photo from Banting House. It was donated to Banting House by Mrs. Dorothy Shaw, whose mother-in-law Lila Shaw purchased the 442 Adelaide St. property from Banting in 1921. It shows a larger Silver Maple on the far right of the image and a smaller Silver Maple towards the center, right above the drain at the road. In all honesty, I was frustrated when I found the photo. It meant that we were going to have to significantly change the report we had just finished on recommendations for the landscaping after having spent a significant amount of time searching for similar photos. When Grant got back this week, we spent almost an hour trying to figure out how this one photo changed so many of our recommendations. We had both thought that we were finished looking at the landscaping and the photo came as a huge shock. During our conversation, though, I came to realize how this photograph actually makes a great addition to the report and strengthens our recommendations. The trees and bush were well enough established in the photo that we are confident that they had been in place while Dr. Banting lived in the house. If we hadn’t come across this photo, Banting House would probably have the wrong type of tree planted outside later this spring (we hadn’t been able to properly identify the tree species from the other photos we were working with but could identify the Silver Maples in this one) and there would have been no planning for a second tree. Using the photograph as an historical source helps to increase the authenticity of our recommendations. Instead of relying on our best guess, we now have a clear vision of what should be planted to return the landscaping to how it looked when Banting lived here. This is a great example of how historical research process can have so many twists and turns. Even when you think a project is finished, there can always be another piece of evidence that pops up and changes your entire evaluation. Even if it’s frustrating at first, uncovering evidence such as this photograph helps to improve our understanding of projects and improves the outcome in the long run.